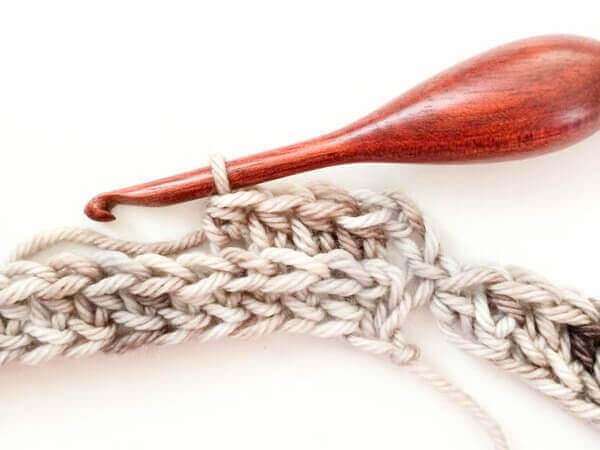 Easily achieve a knit look with basic crochet stitches … if you know how to work a half double crochet, you can do this! 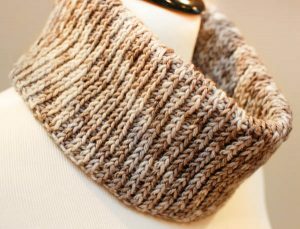 I designed this “Knit” Crochet Cowl Pattern to be worked in a tubular structure because I really like the appearance of the “knit” stitches appearing vertically as opposed to horizontally. 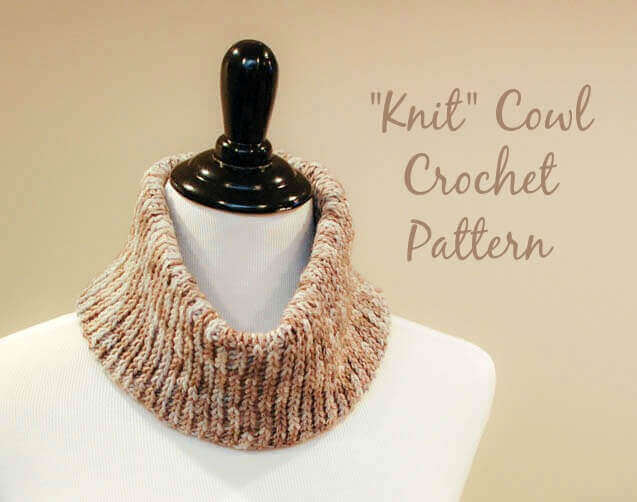 As an added bonus, not only is it warm and cozy, but it also stands up nice around neck. Finished cowl as written equals 4½ in. high × 24 in. circumference but can be customized to any size; additional yarn may be needed if making larger. Chain 37 sts (or work a Foundation Half Double Crochet of 38 sts as shown in my tutorial here and continue to Row 2 after joining to form a ring). Row 1: Work 1 hdc in 3rd ch from hook and each chain across, join in the back bump of beginning chain to form a ring — 38 sts. For Row 2 and on we are going to be working in the third loop, also sometimes called the middle loop, of each half double crochet stitch … this is what achieves that knit look. If you have never worked in the third loop, it appears on the back side of each half double crochet stitch (see photo below). 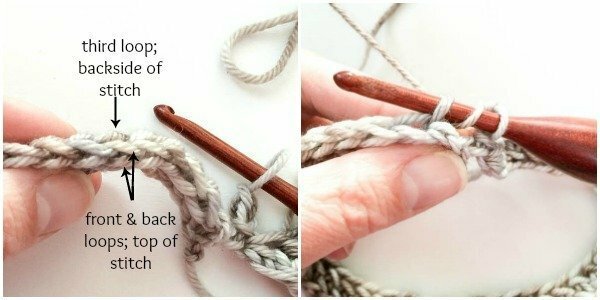 Just yarn over and insert your hook through that third loop and complete your half double crochet as usual (that is, yarn over again and pull through the loop, yarn over and pull through all loops on hook). Row 2 through 62: Ch 2 (counts as st), work 1 hdc in the third loop of the next st and each st across, join in the back bump of beginning chain — 38 sts. Love the hook? Find out more about it at the bottom of this post. Now all that is left is to join the bottom edge of Row 1 with top edge of Row 62. 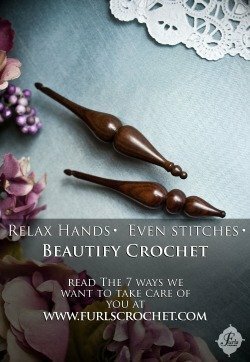 You can do this in the method of your choice, such as by slip stitching around or by fastening off and leaving a long tail to whip stitch around with a yarn needle. Weave in ends. Block if desired; you can reference my post How to Block Knit and Crochet Items for more information on blocking. I get so many compliments and inquiries about my Furls hook. It is a handmade wood Furls hook and it is divine! You can find out more about it or buy your own through my affiliate link here or by clicking on the image below. Hi. Love this simple pattern. Here is my question . I have BERNAT SOFT BOUCLE in shades of gray 5 oz. skeins Suggests using ‘J’ hk. This is not an easy yarn to work with…..Excited about neck warmers for two men who have to work outside and in open areas here in Michigan during Winter as job calls for …..Working on swatch now with ‘I’ hook. Asking honest opinion using this type of yarn for this cowl ? Hi Wendy 🙂 Hmmm … I wish I could say for sure, but I don’t believe I have used that yarn to say for sure. My best advice would be to work up a test swatch in that yarn to see if you like it. Hope that helps! This looks like a really easy ‘neck warmer’, and something different to do for all of us long time ‘set in our ways’ crocheter’s. I will definitely make one (or more). I think an autumn colorway would blend with many fall tops, and look really neat. This would make a great gift as well, and be quick to make. I just started one of these in a colorway that’s orange/brown/green/red and literally called “Autumn Stripes” when I saw your comment…yes, it does look really pretty in those colors! You should do it! Hello, I am trying to make the cowl you designed and each time I come to the 38 stitches of foundation half double crochet stitches I measure around my neck and wonder how it is suppose to fit. I know you mentioned to customize the pattern but I am not that experienced in changing the pattern. You mentioned the finished cowl measures 24 inches, how does 38 stitches become 24 inches finished cowl.? I hope to make this for my granddaughter for Christmas. Please advise. I love your pattern & hope to make it. The 38 stitches are worked in the round and make the width of the cowl not the length. You would keep working until you reach the length you like and then sew the ends together into a cowl.